Not long ago I cheered myself up by making a necklace from left-over beads of all colours. 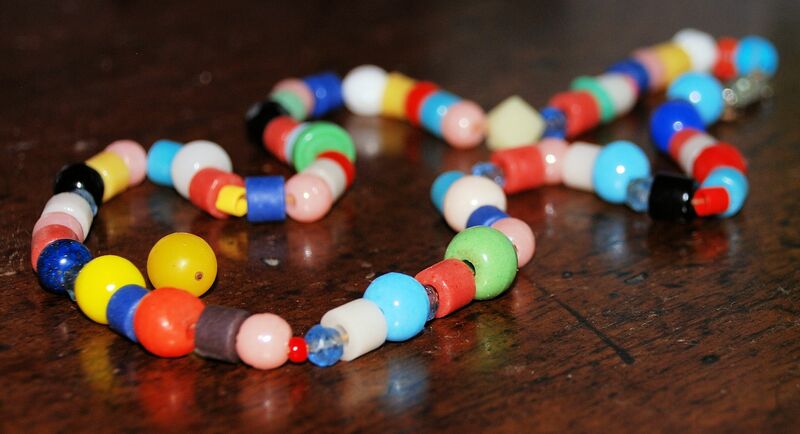 Unlike Italian womenfolk whose winter wardrobe is black, dark grey or dark brown, I prefer colour in the winter months, and what could be more colourful than these beads? I had the numbers to go for symmetry, but I deliberately went for random. There’s a charm in randomness and asymmetry which many a stately home could have borne in mind. The odd yellow bead loose off the thread is a yellow mistletoe berry – one of many scattered through the gravel and leaves under the big oak; the only colourful note now that frost has killed off the flowers. They might look fun to squash underfoot, but the white goo that comes out is as sticky as chewing gum! This is your ultimate no-problem rose. 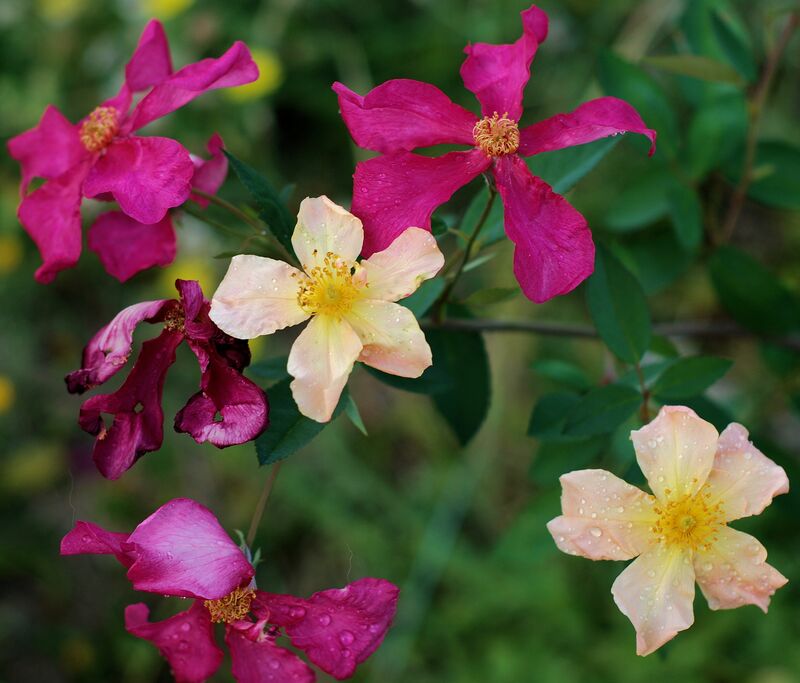 It’s hardy, fast-growing, doesn’t need pruning, and has no thorns. It’s also very beautiful and full of surprises with all its different colours. We planted it in front of a telegraph pole to conceal it and it’s getting there, gradually. The blue of these flowers is one of the most beautiful colours in the natural world. They’re like the bluest of eyes. They’re the colour of the sky at its deepest, in the very apex of the firmament. At dusk they shine out – presumably something to do with ultra-violet light. 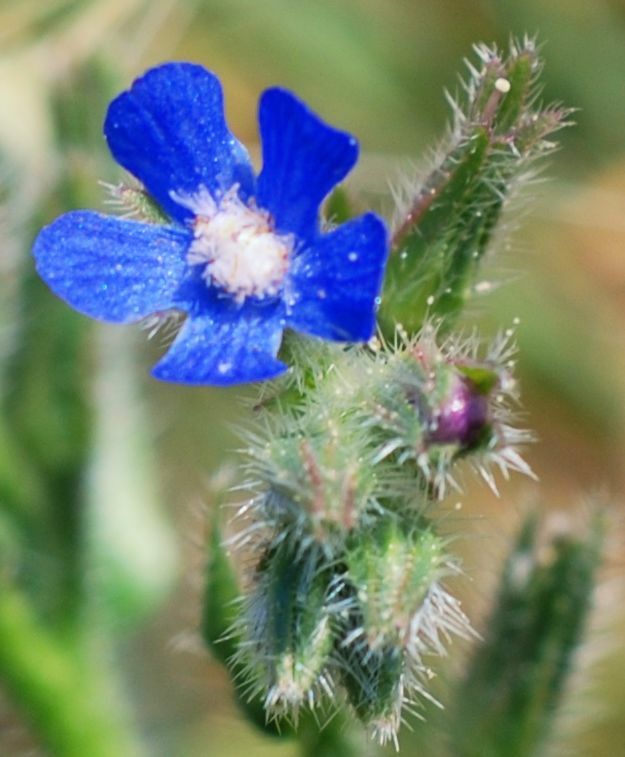 ‘Large blue alkanet’ isn’t a description – it’s a name. Somehow I think it ought to be called something much more special. 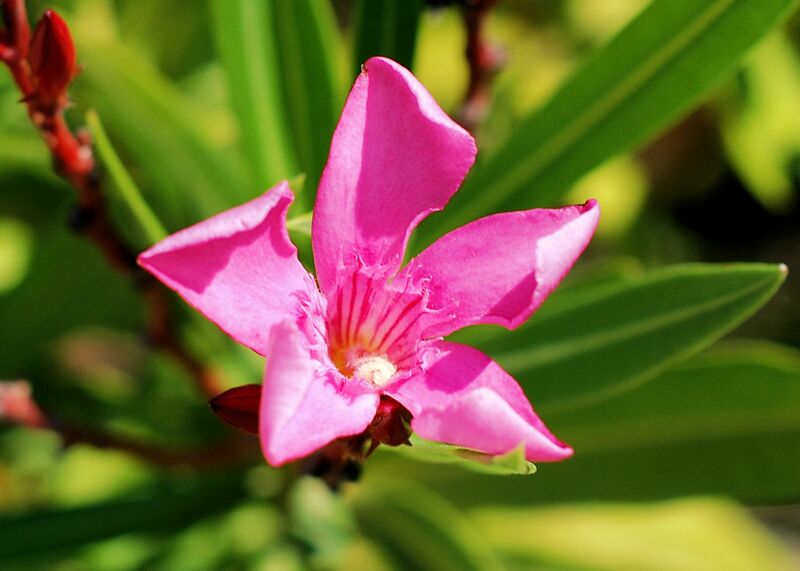 The oleander season is just beginning; this is one of the first blooms to open. The altitude we’re at is a bit too high for oleanders to flourish because every year the frost battens them back, killing some. But they still make a display, with colours ranging from pure white through ivory, apricot-and-cream, shell pink and pink to deep red. Their smell seems to vary according to colour and even individual bush, but this pink one has a sweet, light perfume of vanilla and rose with a hint of coconut. They don’t need much watering (although they appreciate it) and since the winter prunes them anyway, I don’t need to! This is the path that runs round the back of the flowerbed, next to the edge of the ‘moat’. Every colour of the rainbow is present. 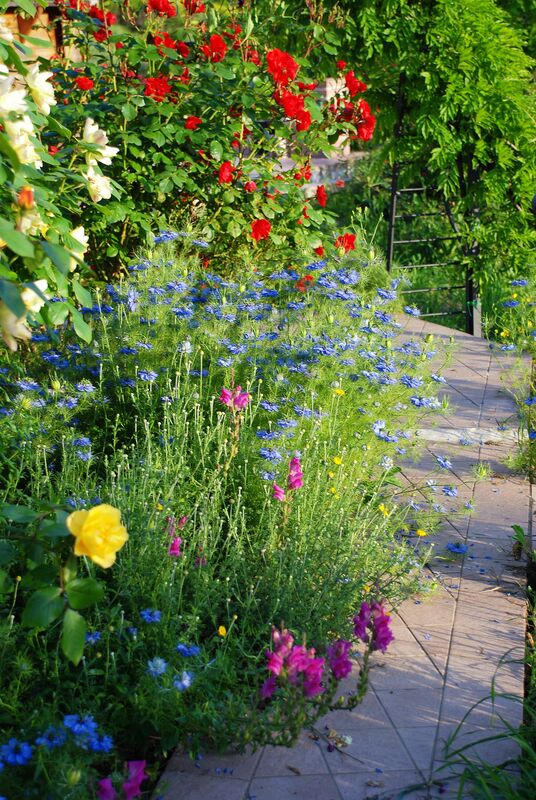 It’s a narrow path – only 60 centimetres (2 foot) wide – but the flowers have decided they’re going to make it even narrower. In one place we’ve battened back a rosemary with a trellis of sticks so that you can actually get by. Sometimes you have to break the amorous bond of 2 sweet pea tendrils joining from opposite sides. 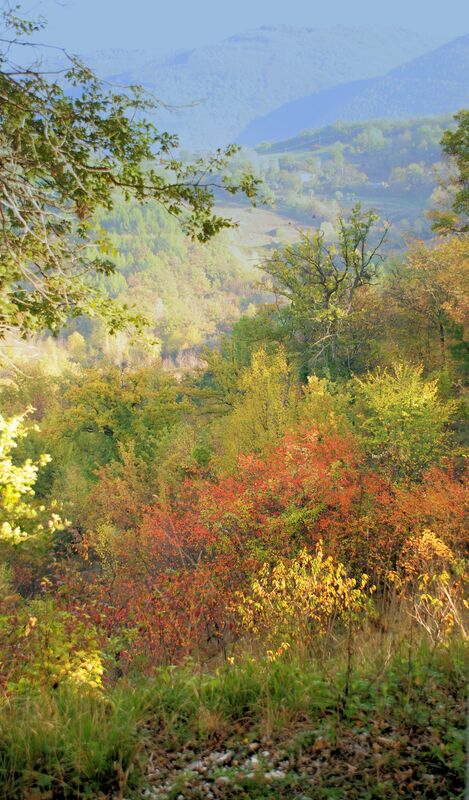 But it’s not a path that takes you anywhere in particular – just one to enjoy!